Here are five ghosts, all residence of central Adelaide, who you may well have passed. If you're up for a fright - grab a torch, somebody's hand and do some ghost busting. The original owner Mr Bonython was said to have thrown his wife off the tower when she found out about his mistress. But she didn't die, so he dragged her up the stairs and threw her down again. The story begins in 1885, with the caretaker Francis Cluney, the father of five was working alone one night when the light flickered. He went to investigate and fell into the generator. The newspapers reported his body found with a third of his skull missing. However, there is also a more devious presence. A woman was shot by her husband in the lane between Regent Arcade and Adelaide Arcade. The husband was later hung in Adelaide prison. Grounds keeper Brown hung himself in a classroom on March 29th 1940 and his body was buried on the ground. Every year on March 29th things are said to move around. Justice was harsh in the colonial days with people being hung here until the 1960s. To visit Adelaide Gaol, go to the website. 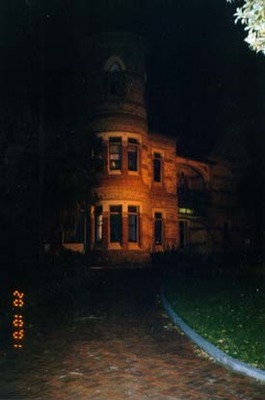 To book of Adelaide Cities ghosts with ghosts investigators, click here. (If you decide to creep around on your own, bear in mind that Carclew house is An Arts Youth Centre and the Norwood Primary is a school- please obey the law). Okay, so my research shows Adelaide ghost aren't the most menacing or convincing on the planet, but their stories tell us something of life in the past; the same dramas, intrigue and anguish that ended their lives, are all around us in modern life. Through their ghosts or the story of their ghosts we have not forgotten their lives nor their injustices. If you have a better ghost story, please let me know. I've never actually visited any of these places, but I do love stories of Haunted buildings. I don't necessarily believe them, but I do think that they are still very spooky whether you believe in ghosts or not. My high school used to be owned by the Barr-Smith family, so is an old residence. We used to love making up ghosts stories about people that had died in the house, I don't think there was any truth to anything but I love the ghost stories that are inspired by these historical buildings. That's really interesting!! I'm from Scotland, and love the spooky histoy of the UK, so it's always nice to learn new things about Adelaide.